Ever since the advent of the ‘Talkies’ sound technicians have struggled to pick up speech in motion pictures with sufficient clarity. For many years the problem of getting the microphone close enough to the performers without it being in the camera shot was a constant challenge! On the other hand if the mic was too far away the sound was often ruined by the pickup of unwanted surrounding noise. Seeking to address this problem, in October 1959 Wayne A. Beaverson of Electro-Voice filed for a patent on a new type of directional microphone which could be successfully operated at a distance from the sound source. 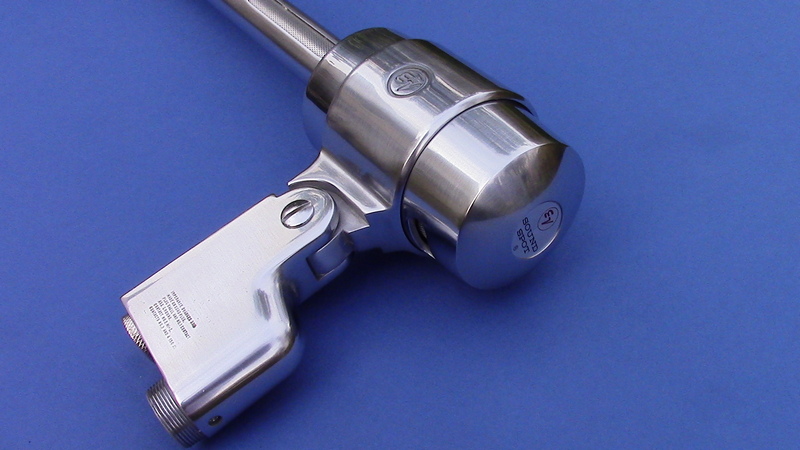 At low frequencies this microphone exhibits the directional characteristics of a cardioid mic, with excellent rear rejection. As the frequency response rises it becomes a line mic with considerable attenuation of unwanted sound from the sides. Thus the new ‘Cardiline’ design provides excellent directivity right across its operating frequency range. 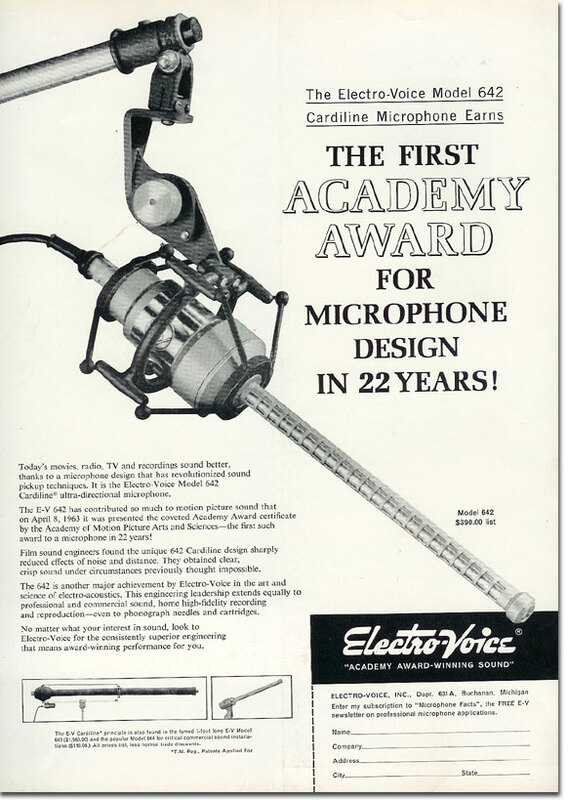 Although the Academy Award went to the 642, the microphone drawn and described in the original patent application was in fact its close cousin the EV644. At this point you might be wondering about the 643? Well ……… The 643 was pretty much the same as the 642 except in one significant detail ……… it was just over 7 feet long! 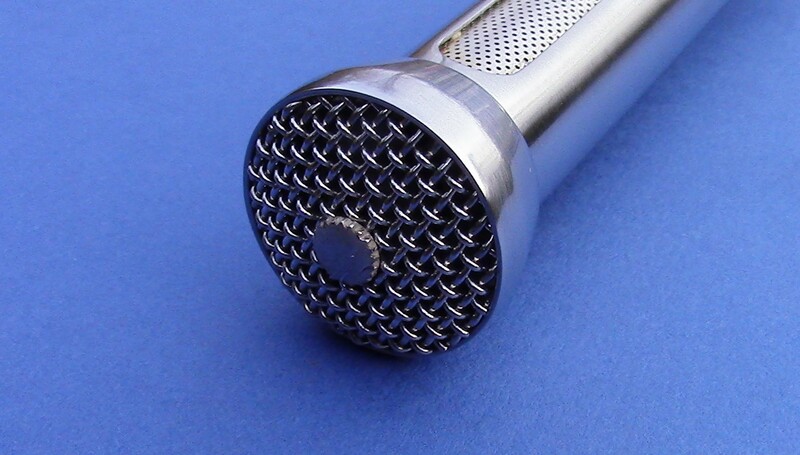 All three of these mics were of the Cardiline pattern but they were aimed (excuse the pun) at different areas of the market. As we know, the 642 was tailored very much for the film and TV industry and came with an elastic mount for attaching to a boom. 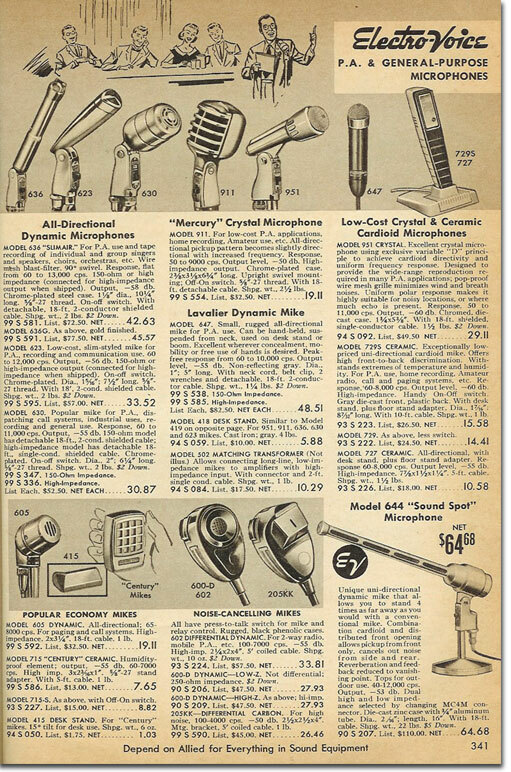 Although extravagant claims are made for the mighty 643 in the advert above, I suspect that this mic was in fact quite awkward and unwieldy to use (even sighting along the barrel!!) It is certainly hard to find any fond recollections of it. I came across one report from some poor sod who once spent an afternoon standing on the roof of a football stadium trying to follow the ball round the field!! Anyone who has ever operated a theatre follow spot will appreciate just how ludicrous that must have been! 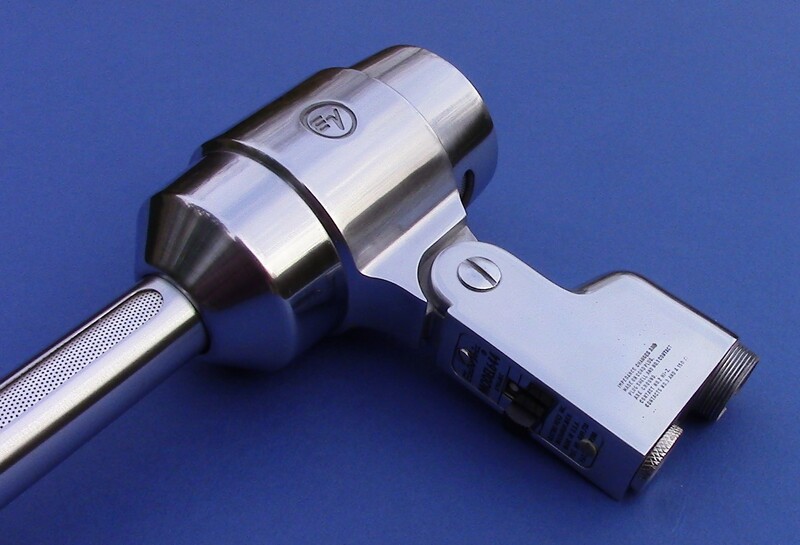 Designed for use on stage, in theatres, auditoriums and churches, the EV644 Sound Spot came with a microphone stand mounting and was finished in classic Electro-Voice chrome. You could also buy it with a dull matt paint finish,(non-reflective under lighting), but why do that when the chrome version just looks so rock’n’roll cool ! The 1963 patent shown above acknowledges a number of earlier inventions relating to directional microphones. In particular the patents of Harry Olson dating back to 1939. However, the earlier inventions, (mostly involving complex arrangements of multiple tubes of differing lengths), were awkward and cumbersome. In contrast, Beaverson’s Cardiline microphone, using a single multi-path tube feeding a single cardioid capsule, was an uncomplicated work of genius. It was both effective and easy to use. 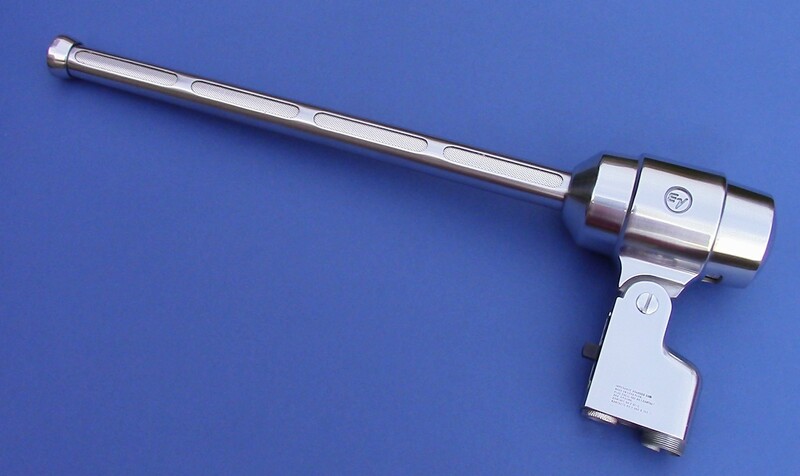 To this day the elements of Beaverson’s patent can to be seen in shotgun microphones all over the world. Below are the Techincal Specification Sheets for all 3 microphones. This entry was posted in Microphone techniques Ancient & Modern, Vintage Brochures and Tech Specs, Vintage film recording, Vintage Microphones, Vintage PA Microphone and tagged 1960's Microphone, EV644 Sound Spot, Talking Pictures, Vintage Microphone, Vintage PA microphones. Bookmark the permalink. Hi Martin. 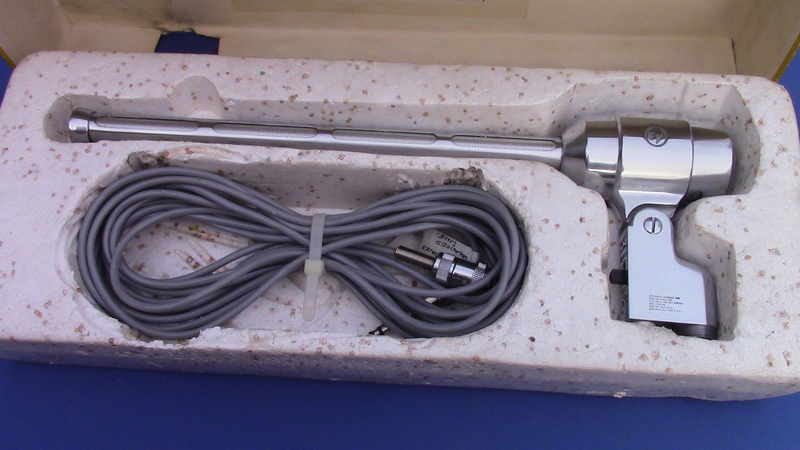 Thank you for your article about the Electro-Voice E1642, 1643 & 1644 Cardilina Microphine. You cited my father Wayne A. Beaverson of Electo-Voice for the patent on a unidirectional microphone. Your article is a great tribute for his contribution to the world of electronics. He died October 28, 2017. We will likely include your article at his memorial service. Dear Nancy, So sorry to hear of your father’s passing. Please accept my condolences. I have long been an admirer of his work. In the history of microphone technology there are a number of inventions that can be seen as real game changers. 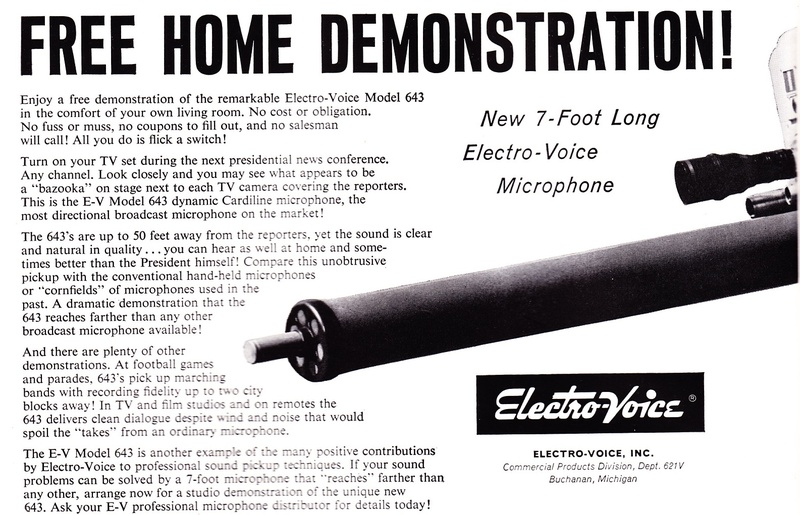 The ElectroVoice Patent for the the Cardiline microphone which bears your father’s name is one of those inventions. It completely changed the possibilities for recording dialogue in the cinema. Indeed for recording any sound at a distance. A brilliant work of genius! I would feel very honoured if you decide to use my article in his memorial service. How much would one sell for today? I paid £100 for my 644 on eBay. 642s tend to go for slightly more. However, I have never see a 643 for sale. Dave B. here again – I have a friend who just shipped me a 642 – what a beauty! Shame it doesn’t pass audio. I am assuming it does not need phantom power, correct? At any rate, anyone you know either in the States or overseas who can actually repair this puppy?? Hi Dave, Good to hear from you. No, it doesn’t need phantom. It is a dynamic and the EV capsules of this period have a great reputation for being robust and reliable. So hopefully the problem may not be the capsule. The most common causes of failure are the on/off switch and the wiring to the plug. I have a 664 which arrived looking great but the switch was dead even through it felt ok and the previous owner had re-wired the 4 pin amphenol connector completely wrong. 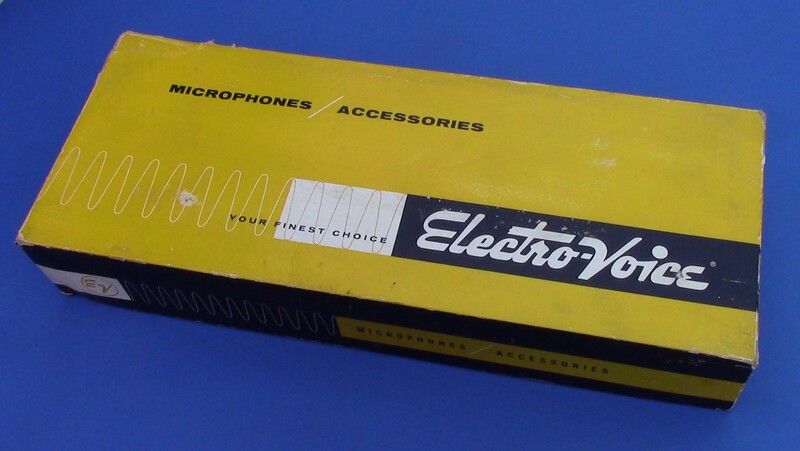 Sadly I don’t know anyone at the moment who repairs vintage mics (apart from ribbons) . I’ll ask around and get back to you if I find anyone.